The NEDS board held a telephone meeting on October 24th. We discussed the conference and went through the feedback. The feedback was for most part positive, but there were also some valuable lessons for future conferences. Otherwise it is business as usual in the Nordic countries. Members meetings will be held in the spring and most societies are working on developing their websites. AED will host its ICED conference in Prague in June 2016 and we hope to see many Nordic colleagues there. The NEDS board will meet in Oslo in January to plan activities for the coming years. Please contact your National representative if you have any ideas for or inquiries about NEDS. During the NEDS 2016 conference two new potential NIGs held their first workshops. It looks like the NEDS family will have interest groups for both Eating disorders and physical activity and Nutritional rehabilitation. The board still awaits formal applications from the groups, but both groups should soon be presented on the website. Any member of a National society in NEDS is free to join any interest group. Contact the contact person listed under each NIG to hear what is going on at the moment. The NEDS General assembly was held in Helsinki Friday September 23rd during the NEDS 2016 conference. The board was granted discharge and a new chairman was elected. Rasmus Isomaa from Finland will take over after Mette Waaddegaard, who has been chairman for the last four years. The National societies elect their own representatives for the NEDS board (see Board to find out who represents you in NEDS). Iceland was accepted as full member of NEDS and they will host the next NEDS conference in 2018. See www.nedsconference.com/2018 for a sneak peak. The new NEDS board will now start its work and we aim to visit all member countries during the coming four year period. Do not hesitate to contact the chairman or your National representative if you have any questions regarding the activities of NEDS. The NEDS board held a telephone meeting on August 15th. Here is a short summary of the meeting. More details are available from each National representative. We mostly discussed the upcoming conference. Other than that we discussed preparations for the NEDS general assembly and the economy of NEDS. The NEDS board held a telephone meeting on April 28th. Here is a short summary of the meeting. More details are available from each National representative. A two-day meeting was held in Copenhagen on severe and enduring EDs and on personality and EDs. The Danish society has elected child psychiatrist Ulla Moslev as new chair. The Norwegian society are working on their web site and are involved in writing guidelines on excessive exercise and EDs. 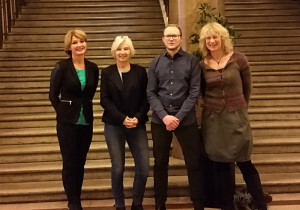 The Swedish society arranged a meeting around emotions and EDs. The Finnish society arranged a one-day seminar on EDs and neuropsychiatry. 2. The board discussed practical arrangements in regard to the upcoming conference, e.g. rules of cancellation, one-day tickets, the gala dinner. 3. The NEDS general assembly will be held in Helsinki during the conference. The board is responsible for meeting arrangements and will prepare everything in advance. 4. The board was informed via e-mail on the economy of the society. 5. The first World Eating Disorder Action day on June 2nd was discussed. The NEDS board met in Helsinki February 4th 2016. The board focused on the upcoming congress and development of the society’s work. We got a tour of the congress venue and discussed practical issues. We reviewed the abstract evaluations made by the scientific committee and drafted the full program for the conference. All authors will be contacted during the coming week. We also started writing rules of procedure, a sort of guideline for the work of the board. See you all in Helsinki in september! The NEDS board (Jorunn Sundgot-Borgen, Inger Becker, Rasmus Isomaa and Lena Westin) in Helsinki. Missing from the picture is chair Mette Waaddegaard. In addition to the plenary sessions at the conference, we are looking forward to a lively exchange of ideas from all Nordic countries. The abstract submission system will open in the autumn of 2015, so start the discussions in your clinics and research groups. More information will be published on the conference website www.nedsconference.com early fall 2015. The programme for Neds Conference 2016 is taking form. We have many exciting speakers and topics already confirmed for the upcoming event. Plenary sessions will cover topics such as what evidence based treatment really means; misconceptions about eating disorders; the personality of the patient; treatment expectations; compulsive exercise; history of restraint in psychiatry. Our speakers include Cynthia Bulik, Carrie Arnold, Jörgen Herlofson, David Clinton, Pia Charpentier, and Jorun Sundgot-Borgen.